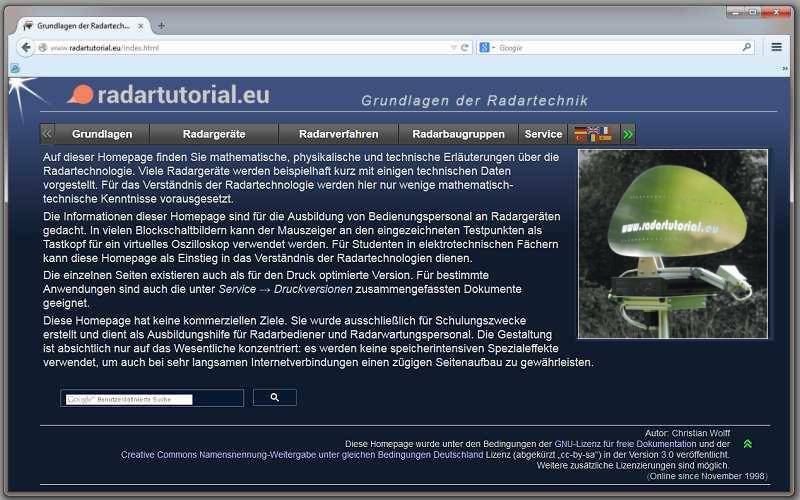 The History of the homepage “Radartutorial” began in 1998 during a course at the Technical School of the German Air Force in Lechfeld (Bavaria). It was a very mixed course with beginners and participants with engineering diploma. The beginners were severely disadvantaged and often could not follow the discussions between the graduated engineers. Even the personal written summaries had very different quality. Of course, we helped each other in a comradely way as well as possible. Initially, only the summaries were made available to each other to complete their own notes if necessary. In the evening I began to expand my notes on the computer with help of my previous knowledge in such a way that they became comprehensible even to comrades who found the topic more difficult. These documents were then exchanged on a floppy disk. The storage capacity of the disk was quickly exhausted. Suddenly, the idea came to not create such huge MS-Word files, but to use the much more economical HTML format. That could also read those comrades who used a Macintosh. A big help for me was my son, who already was enthusiastic about computer technology as a student and who taught me this technique. It was only a small step to put these training aids on the internet as a virtual course. The teachers were not enthusiastic about it. They also argued that this homepage could be a betrayal of secrets. The company commander then even examined the case officially. The then security master of the school checked the internet address to check how big the offense was. On 17.11.1998 I was told: What I wrote on the internet is harmless! During my remaining service there were various reactions from the superiors: partly with great praise (also with a cash bonus); sometimes very negative with the view that a soldier should not use the Internet. This was subsequently examined by the Parliamentary Commissioner for the Armed Forces of the German Parliament. It led to the confirmation that even a soldier has the constitutional right to free publication. Of course with the restriction that I should not reveal any secrets. This was then eagerly monitored by various services. At first I tried to continue the maintenance of the homepage even after my retirement in my former office. Unfortunately, I have not found anyone who would be willing to continue this. Even the Technical School of the German Air Force rejected this, arguing that the effort would be too high to change the CSS-file of this homepage to the corporate design of the German Bundeswehr. The first years was used a free provider. 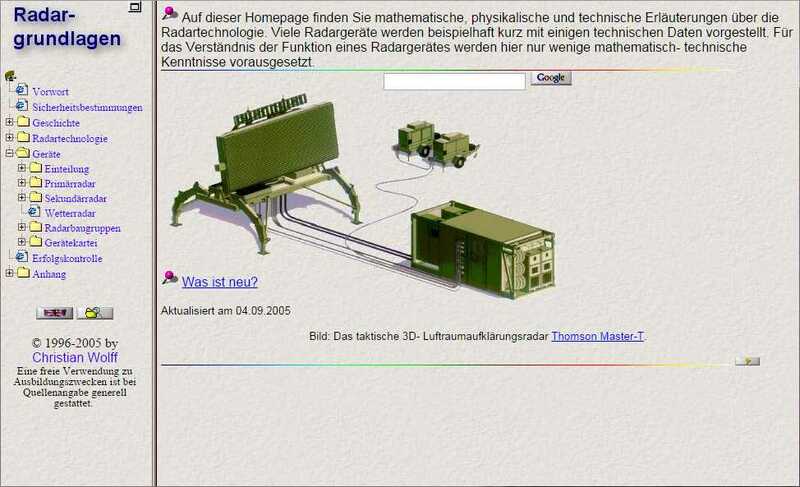 The domain was called „http://mitglied.tripod.de/radargrundlagen/“. (The free offer has certainly paid off through the banner ads that ran across the screen.) The relatively complicated name was difficult to convey verbally. However, very soon Google was able to find this page via the search term "Radar Basics". From the beginning, the site was in first place in the Google search list. Since the banner of the free provider was very intrusive, a separate domain was searched. Unfortunately, it was a common bad habit then to reserve any domain name and then try to sell that domain name. 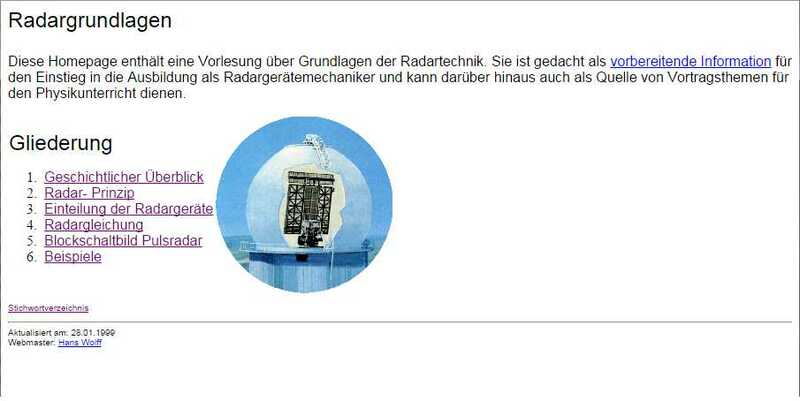 Therefore, instead of www.radargrundlagen.de I dodged on the name „http://www.itnu.de/radargrundlagen/“. The abbreviation ITNU meant here „IngenieurTechnische NutzerUnterstützung“ (technical user support by engineers) and was the name of my office. At the suggestion of trainers of the Lufthansa Aviation School, the homepage was translated into English language. That was the start of the international success of this homepage. At first I was very enthusiastic about Wikipedia and started copying entire pages of my homepage into Wikipedia. The enthusiasm followed the disillusionment. Often statements, just because they were shown in the English Wikipedia as “true”, were also adopted in the German Wikipedia and administratively defended against attempts to change. For example, it says in Wikipedia that, for example, Robert Wattson-Watt had allegedly invented the radar and that the magnetron was a purely British development. The big danger of such a community project like Wikipedia is that instead of the state of knowledge of the society are depicted the common prejudices of an ignorant majority only. So I almost completely stopped my activities on Wikipedia. Only now and then does come again an occasional period of edits, when somebody stubbornly tries to document his ignorance. Sometimes this produces really good articles, such as the article about the continuous wave radar, which is actually just a summary of the CW and FMCW radar pages of this homepage. My homepage has become a reference for Wikipedia. The number of so-called “back links” from the internet is overwhelming. The number of visitors to this homepage is much higher than the number of visitors to the corresponding Wikipedias pages. When exactly the homepage "Radar Basics" was created on the Internet, can not be determined with certainty today. The backup copies that were saved on a floppy disk at this point in time are no longer legible and have long since been disposed of. The homepage initialising course took place from 20.10.1998 to 11.05.1999. The homepage was created during the first lesson phase, the "Radar Basics", which took place during the first 4 weeks. The first big back-up on a CD is from 30.01.1999, so currently almost 20 years old. That is why the homepage celebrates its 20th anniversary in 2018.